Tata Sky India’s one of the largest DTH Service providers with 13 million subscribers has come with amazing offer Jingalala Saturday offer for those who don’t have used Tata Sky HD pack. Get Tatasky 1 month HD access for Rs. 5 only, offer valid only on 9th April 2016. How to avail this offer. To avail this offer give a missed call on 07679976799 from your register mobile number with Tata Sky. Second month onwards a regular price of Rs. 175 per month will be applicable. 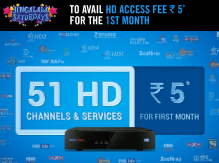 Tata Sky Jingalala Saturdays HD Access Fee Offer (‘Offer‘) is a promotional scheme which is being offered by Tata Sky Limited (‘Tata Sky‘) to its Eligible Subscribers. Eligible Subscribers shall mean a Tata Sky Subscriber who has an Active Account Status and does not fall within the category mentioned in B (1) of the General Terms. Under this Offer, on 09th April 2016, Tata Sky will offer a discount on the HD Access Fee to its Eligible Subscribers. Under this Offer the HD Access Fee shall be at the rate of Rs.5/- for the initial period of thirty (30) days (‘Initial Period’) instead of the regular price of Rs.175/- per month charged by Tata Sky to subscribers who pay the HD Access Fee. For avoidance of doubt, it is clarified that beyond the Initial Period, the Eligible Subscribers shall be charged the regular price of Rs.175/- per month or such other price as may be charged by Tata Sky at that period of time. Missed call: By giving a missed call on 076799 76799 from the Registered Mobile Number (‘RMN’) of the Eligible Subscriber. Tata Sky website: By logging on to My Tata Sky on www.mytatasky.com. After making payment of the HD Access Fee, the Eligible subscribers will be able to watch all the High Definition Channels which is/are a part of their subscription either through Base Pack, Add on Pack or Standard Definition A-la-carte.